LAKE MARY, FL-(January 12th, 2016)- Fonon Corporation (“Fonon”) is pleased to announce first time customer Woodex Bearing has placed a purchase order for the company’s MarkStarPRO™. Woodex produces bearing material from petrolatum wax impregnated rock maple. The highly-durable material is used extensively in wet/dry screw and roll conveying machinery. Fonon’s MarkStarPRO™ is a member of the company’s Laser Photonics’ brand of marking & engraving systems. 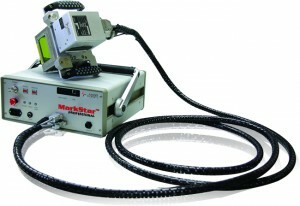 The MarkStarPRO™ is the industry’s only portable, hand-held Fiber laser marking system that operates on a 12V/24V DC and/or 110V/220V AC power source. Designed to operate under continuous shock, vibration, and dust conditions with a MTBF of 50,000 hours, the MarkStarPRO™ provides maintenance-free Direct Parts Marking (DPM) including barcodes that are permanent, legible, and non-removable. The unit includes a 20W DoubleFast™ high-speed Q-switched Fiber laser with a 160mm lens providing a marking area of 4” x 4”.